Chinese Hackers - Miata Turbo Forum - Boost cars, acquire cats. A new report released by Mandiant, an American cyber-security consultancy, reveals an astonishing history of hacking and online theft by a group based in Shanghai, China. Mandiant believes the hackers are part of the Chinese army. The firm saw at first hand how the group, dubbed the "Comment Crew", broke into the computer networks of over a hundred Western corporations and government institutions. Over the course of many years, the cyber thieves targeted nearly two dozen industries, with special attention paid to those in technology and sectors considered "strategic" by the central government. Despite the detailed evidence presented by the firm in its report, the Chinese government denies wrongdoing. 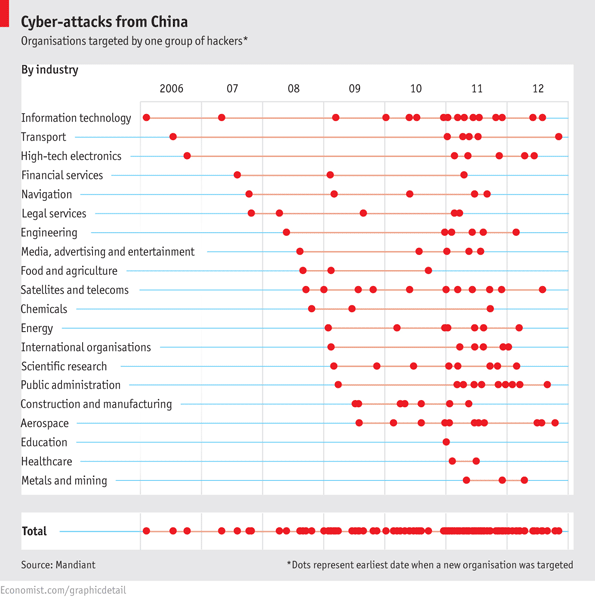 11 was a good year for cyber attacks? Reading tech news from non-tech sources always gives me nostalgia. I mean who else still uses 'cyber'? only when sexing your mom. No, the internet is not a dumptruck. My boy Ted Stevens knows what he is talking about: "The Internet is not something that you just dump something on. It's not a big truck. It's a series of tubes." I'm so glad someone was ready to explain all of the references we were making. Looks like they could care less out about our education and health care information. Hmm. We are ******* those up more effectively than they ever could without their help. Seriously. I don't even know where cyber comes from but my guess is a short version of cybernetic. Which has virtually nothing to do with the internet. Its incredibly stupid, which is probably why they use the word cyber when briefing elected officials. Same reason most papers write at about a 9th grade level.